Over the past few years we have visited family in Germany during asparagus season. Europe is known as the capital in the world for white asparagus. As long as I can remember our neighbor always brought us fresh green asparagus from his garden. What is the difference? The green asparagus has a more veggie/grassy taste and sprouts through the dirt. White asparagus is deprived of light, thus one must keep mounding dirt around the stalks. 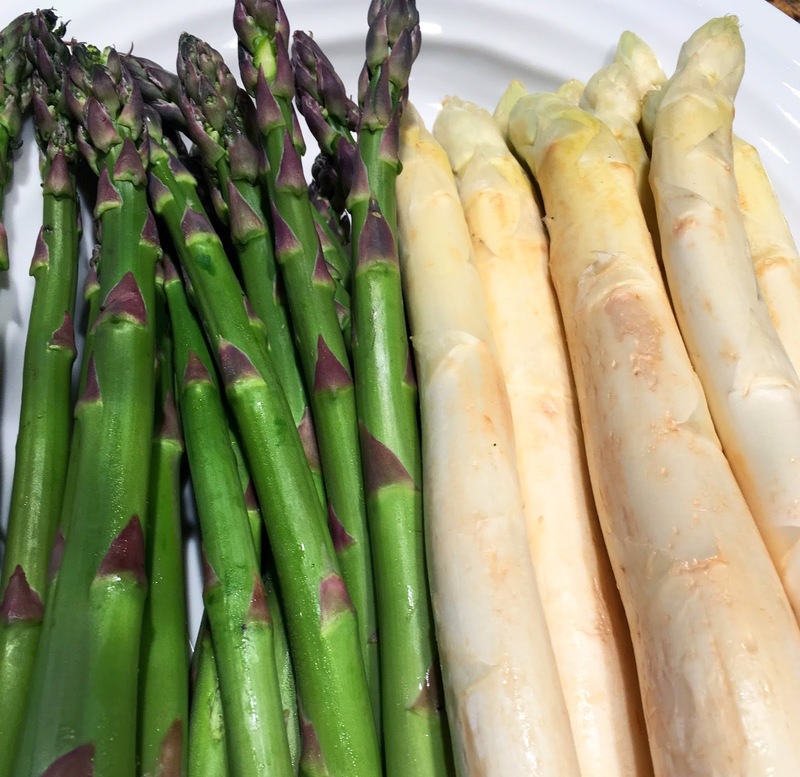 The white asparagus is milder and tender in flavor but also needs to be peeled and cooked a bit longer. 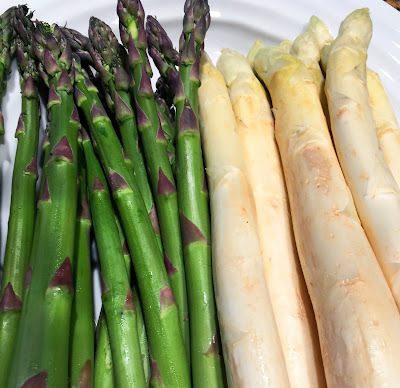 I was excited to find the white asparagus at our local market, but truly, it is double the price as the green asparagus. So this year we thought it was time to try something new and we planted our first batch of white asparagus. Brown bacon over high heat. Set aside and drain on paper towels. Whisk together egg yolks, water and Italian cheeses. Place bowl over a pot of simmering water (double boiler effect) and whisk constantly (7-9 minutes) until mixture is thick and creamy. Add seasonings and keep the sauce warm. Cook asparagus in water until tender. Don't over-cook, keeping it nice and green. Drain and pat dry. Then place the asparagus on a serving platter and garnish it with bacon, Parmesan cheese and sauce. Tip: The easiest way to eliminate the woody stems is to break them off by bending them until they snap in two. This is generally where the tender asparagus begins. We love asparagus and my small patch gave us a few meals this year (finally after 3 years of growing). We enjoyed white asparagus while on a trip to Europe (in the Netherlands especially) several years ago - what a treat! Your sauce recipe sounds delicious Marg! I agree with Rosella; the sauce recipe sounds delicious. I'm thinking it might be nice on other vegetables, too. Your dish looks so delicious! I'm going to have to try it this way!